GRASSP exists to use soccer as a tool to help students identify with, connect to, participate in, learn from and enjoy school – as well as developing good character & grasp a hold on good decision making skills for life. Valencia Chavez, the Principal at Swegle Elementary School. 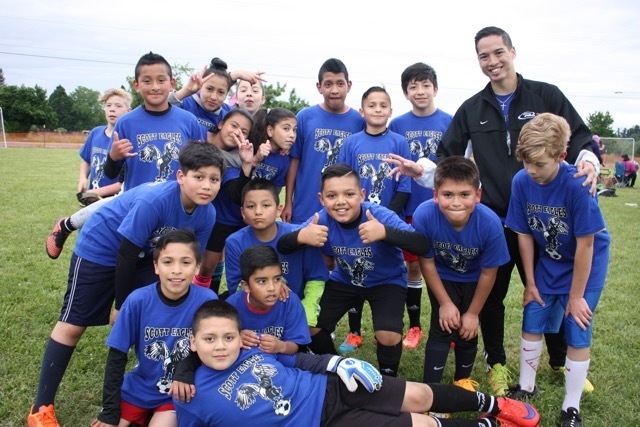 Dave Irby with the Cascade Surge Soccer Team was contacted by Ms. Chavez to discuss the potential for an after school soccer program at Swegle Elementary. Dave Irby set up a meeting with Ms. Chavez and invited Calvary Chapel of Salem and Salem Leadership Foundation to attend. Hence, an after school soccer program was begun with students that the school administration selected for the program. The program was aimed at engaging students who for several reasons did not connect with their school. Soccer was chosen as the vehicle due to soccer’s international popularity. Dave Irby linked Calvary Chapel with Likius Hafeni, a gifted soccer player and coach seeking higher education in America. Likius had played as a member of the Cascade Surge Soccer Team in Salem. He also has the second-highest coaching certification through FIFA. In the fall of 2010, Coach Likius started the first after- school soccer program at Swegle Elementary with 25 students. Focus on students in need of connection and participation in school, in cooperation with school administrators and staff. Participate in the training of students using the GRASSP format and curriculum. Hold soccer practice and team huddles on a weekly basis, as school schedules allow. Participate in periodic tournaments with other GRASSP teams. Participate in bi-monthly meetings with other coaches and GRASSP staff. Take periodic surveys of the students in program to determine level of impact on students. GRASSP exists to use soccer as a tool to help students identify with, connect to, participate in, learn from and enjoy school - as well as developing good character & grasp a hold on good decision making skills for life.